Whenever I wear my necklace people stop me to tell me how beautiful it is. One very happy customer. 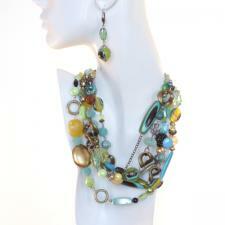 St Tropez necklace, OTF5-17, Hookster® by MS V Designs™, Five strand versatile fashion necklace. With the Hookster®, Experience the Value of Versatility, Exclusively from Ms V. Your Belt, Necklace, and Bracelet All In One!™ Beads of gold, green, turquoise and yellow mixed with chains of bronze. Excellent to wear with any color combination.